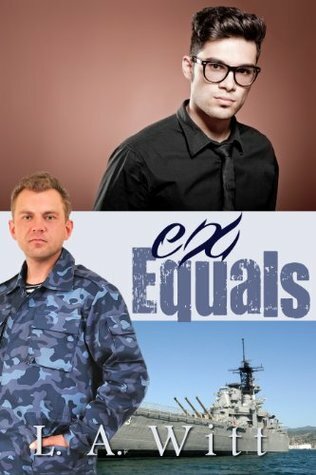 On the first day of his new career as a community college math teacher, Chris Reuben gets an unexpected – and most unwelcome – blast from the past: one of his students is his former shipmate…and ex-boyfriend. Justin Hayes isn’t after a second chance when he signs up for an algebra class taught by his ex. All he wants besides a passing grade is a chance to make amends with the man he loved and hurt while they were deployed together three years ago. Pain, guilt, and bitterness aren’t the only lingering feelings, though, and even if three years is enough to melt the ice between them, they’ve already risked their careers for each other once. Can Justin convince Chris that what they once had is worth putting careers and hearts on the line again? Do you have a ‘usual’? You know your favorite restaurant or diner where you get the same thing? I do. When I find something I like, I stick with it. Whenever we hit our local café for breakfast, I get the same thing- Every. Single. Time. LA Witt is one of my ‘regulars’. I know what I’m going to get. It’s going to be good. I’m going to be happy. Sometimes it will really hit the spot and then other times it will be completely satisfying but not ground shaking. This was one of those ‘yep, that was good’ meals. But, it wasn’t topped off with my favorite slice of apple pie. Second chances? I’m always game. Dual POV’s? Makes me happy. Chris and Justin had a nasty split. They were forced to keep their relationship undercover in fear of repercussions to their military careers. When promotions came around and only one of them got the boost up, everything changed. I was less than thrilled with how Justin stomped all over Chris’ heart and completely understood why their break up occurred. Years later when both men have moved on with their professional lives, they discover neither has moved on romantically. Justin puts Chris on the spot when he snags a place in one of Chris’ classes. Considering this is Chris’ first class college class as a professor, he is anxious enough. Chris’ nerves were strung soo tight from the distracting pair of familiar eyes in the back row, I thought he might snap. And he hates the feelings that threaten to rush forward. He certainly hasn’t forgiven Justin, but the question becomes…can he? The risk is still high but they must find out if it’s worth it. I always enjoy flashes back in time. It’s rewarding revealing the whys behind the foundation of relationships. I adored watching them fall in love and felt their anguish when they bitterly broke apart. I would have preferred more begging and pleading. I wanted Justin on his knees! I think Chris let him off easy, too easy….but I can’t say I blame him. I’d rather forgive and move forward myself. Ohhh and shout out to the pup, I loved the adorable furry child. It wasn’t my favorite LA story, but I was left sated and smiling. You can count on me coming back for more! This entry was posted on April 1, 2015 by Sheri in Cops / Cowboys / Military, Reviewer: Sheri and tagged 3.5 Stars, la witt, self-pub.